We arrive at the third and most difficult area to affect true change. It's easy to buy a new bike, slap on a new set of tires, drop thousands to have the most powerful motor your retirement can buy, but when we ask ourselves what is truly holding us down, we may not like the answer, as it stares back in the mirror. For me, the true brilliance of this hare scrambles racing thing is that so much is dependent on the rider, the machine becomes secondary. I already proved this by running a 1989 KDX200 competitively against brand new machines. This is less true in roadracing, where horsepower and outright speed and the almighty cubic dollar still have a firm hand in the outcome. But in the woods, it is he who does not fall down, he who does not make mistakes and he who can endure the rigors of two hours bouncing from tree to tree that triumphs. A great equalizer. Physically and mentally, I needed to figure out where my problems were. I consulted with a physical trainer regarding my exercise, nutrition and hydration regimen. I train a lot, five days a week, cardio, swimming, weight, flexibility, balance training and sneak a midweek ride in on the dirt bike. On the weekends I ride between six to eight hours over Saturday and Sunday, trying to focus on all types of terrain and riding. The trainer recommended some tweaks and changes, new exercises as well. The most notable change was to mid-race hydration. I had been using nothing but water in my pack during the course of a race. News to me was that over a two hour event an athlete not only needs fluids, but electrolytes and complex carbohydrates as well. I concocted a home brew of all the above and tested it over a weekend of riding with good results. I also began incorporating "active rest" into my training schedule, actually giving my 42 year old body time to recover from the string of abuses I persisted in putting it through. Have to be smarter than an 18 year old if you are going to continue acting like one. That left the mind. As far as I am aware, there is no psychologist for motorcycle racers, at least not one that works for free, so it was up to me to plumb my own depths and figure out what wire had been knocked loose. 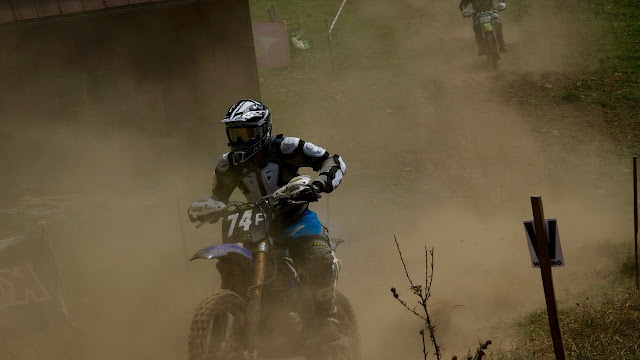 The season began with a very relaxed attitude, enjoying riding and learning the nuances of off-road racing. Somewhere along the line it turned into a serious competition. The fun was gone. It became about getting faster, all the time faster. Pressure mounted into stress, into mistakes and into frustration, into the vicious circle of self-defeat that many racers experience. A return to the halcyon early weeks of the season was needed, a return to fun. Easier said than done. After experiencing success on the track, the only desire is for more of the same. Any human standing on the podium above you is an insult, an affront, a glaring neon monument to your failure, an enemy, a usurper, a target. Common sense, training and technique are the first casualties in the heat of battle. As well as breathing, we often simply forget to breathe. Always trying to find my way through the dust, literally and figuratively.